Cash rents are starting to come down. Some cash rents were lowered heading into the 2016 crop but it appears the stage is set for a material amount of leases being entered into at lower rates for the 2017 crop. In the last few days, we’ve heard seven first-hand reports of cash rents being negotiated at 10-15% year-over-year decreases for 2017. The reports are from Indiana, Iowa, Minnesota, and North Dakota. Based on what we’ve heard, each one of these contracts were not the top-of-market rents that are typically the talk of the coffee shop. Well….it ain’t over until the fat lady sings! That “next person line” is likely very short at the moment. 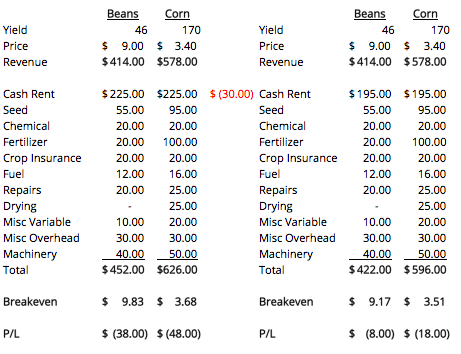 See below for some cost of production estimates on corn and soybeans looking forward. Note that every farm is different and it’s likely that the average farm will have more overhead than what I’ve shown below. A 10-15% decrease in cash rent isn’t enough to get the average farm to break even with no 2017 sales on the books. But it’s a start! 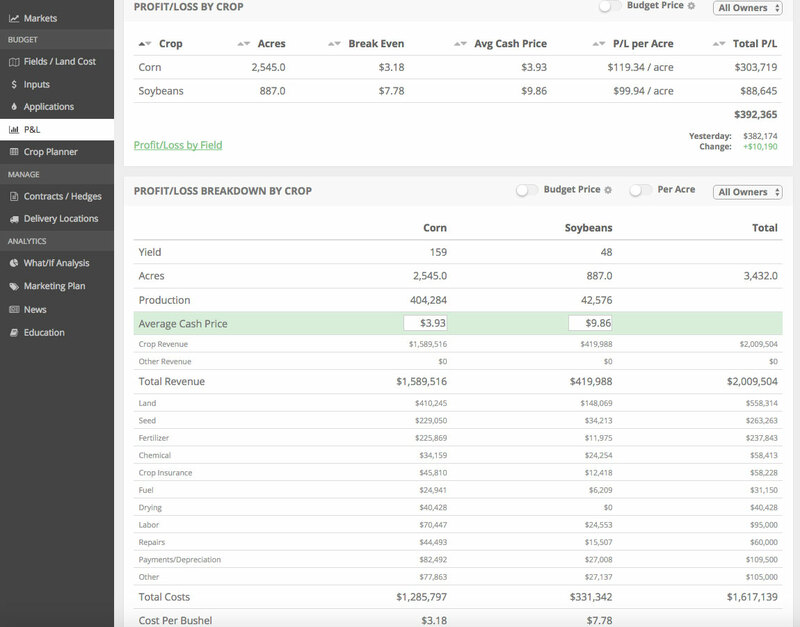 As we talked about in this blog post about The 5% Rule, it’s important to constantly be looking at ways to increase yield, become more cost-efficient, and increase price (see the post for more detail on this). Small changes in each one of those line items can lead to large increases in farm profitability. Don’t fall into the trap of thinking that there’s always going to be someone willing to pick up your rented farmland at top-of-market rates. It may happen but you owe it to your operation to have honest conversations with your landlords about farm profitability. As I’ve wrote in the past, times of abnormally high or low prices are a good time to talk with landlords about flex rents. Now is a good time. It’s very reasonable for a landlord to want more upside if they agree to a rent reduction and a flex rent agreement is a structured way to accomplish this. Click here for an article we wrote on the topic.